I just finished another old shirt project today. And I'm totally pleased with the way this one turned out. It didn't use the 'quick and dirty' approach like I did in my previous two old shirt projects. No, I gave it a lot of thought. I thought about it for several days, actually. In my mind I worked out every single detail before finally handling the scissors, not wanting to mess up my shirt. I even jotted down the steps and made some rough sketches, something I hardly ever do. You see, I really loved this shirt. I always did. I bought it at GAP when little H. was still a baby. 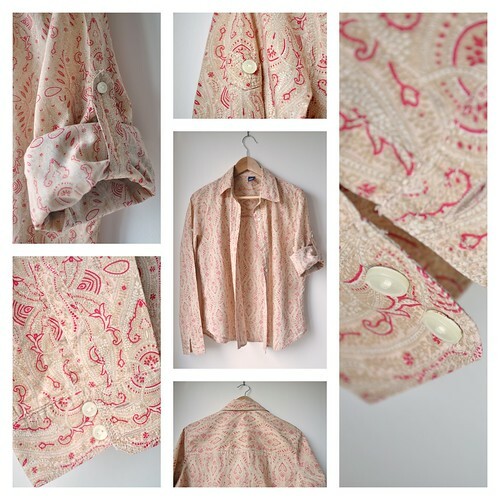 I loved the fabric, the paisley print, the little details like the roll-up sleeves. I made one mistake though, when I bought it. I chose the wrong color. Too pale, especially now that I lost my Californian tan. It makes me look like I'm sick, so I stopped wearing it. But in those days I wore it a lot - it made a perfect breastfeeding shirt. But even though I stopped wearing it, I didn't want to get rid of it - it has too many memories attached, I guess. So, when I came across this shirt again in the 'washed but not ironed' laundry bin, I decided to work it into a new project, with a challenge attached to it: to work as many of the little details of the shirt as possible into the project. Of course, I came up with a bag - what did you expect? 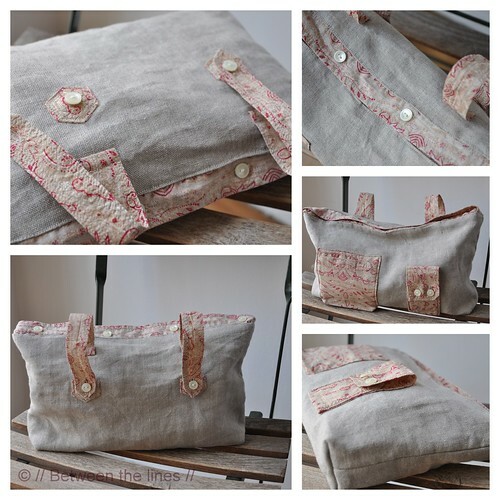 A toiletry bag this time.